This jig -- made with the Fadal -- cuts the dovetail in the neck. 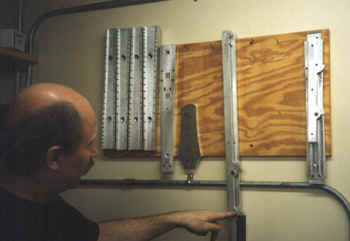 The clamps accurately locate the neck blank and a router with a dovetail bit follows the tapered jig and cuts the joint. 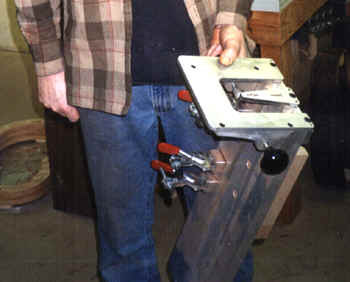 A matching jig cuts the cavity in the ribs to complete the joint. This jig blew me away. (The jig is aluminum -- the wooden box is simply for storage.) 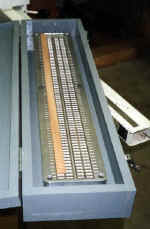 Made on the Fadal, this jig holds four tapered strips (with vacuum) while the Fadal cuts the slots and voila -- linings. You can see one strip of lining in position. 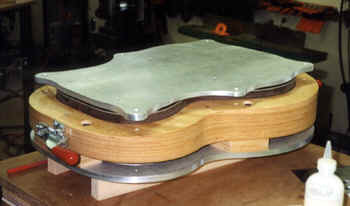 This form holds a set of ribs while the arch of the back is cut. The top of the form is shaped with the precise curvature of the back (about a 15' radius). 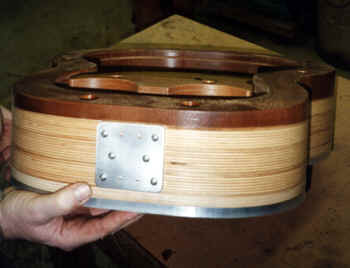 A router is fitted with a base plate with the same curvature, so that it rides smoothly and precisely on the form. The cutter (Jim uses a dovetail bit) cuts the ribs, endblocks and linings to the exact height and curvature to match the curvature imparted to the back by the braces. The result is a perfect fit with no tension. This is the station for gluing on the back. The ribs, with the top attached, are held in the form. The back is placed in place (the cutouts for the braces have been done earlier with another jig which locates them very accurately) and the aluminum piece you see (which has been shaped to the arch and curvature of the back) is used to clamp it all together. It is difficult to describe the precision with which all these parts fit together. More jigs made on the Fadal. There are four cauls for gluing fingerboards to the neck -- these are designed with a precise amount of backbow. The truss rod is slightly pretensioned before the fingerboard is glued on and the combination of this tension and the built in back bow enables Jim's truss rod to act in both directions. The long jigs are used to set the exact angle of the neck to the body. Jim uses a complex but effective method of doing this. This website and all of its content, text and images are copyright ©1997-2004 by Charles A. Hoffman. All rights reserved.